Leading Minds is a research project on methods of persuasion. It brings together ancient philosophical discussions of the skills of “dialectic” (in interactive dialogue) and “rhetoric” (in speechmaking) and contemporary ethical concerns about legitimate methods of leadership and influence. It will combine careful ancient philosophy scholarship to shed new light on ancient discussions, and careful inter-disciplinary work to bring the ancient arguments and claims into dialogue with today’s concerns. The results will include significant advances in our understanding of ancient rhetoric and dialectic. But they will also include resources for assessing the merits of a range of methods and skills by which humans today use persuasion to exercise leadership and influence over others and themselves. To trace the arguments deployed in ancient debates about the proper techniques for influencing and leading others – that is in debates conducted largely in terms of how one should understand the nature and status of “dialectic” and “rhetoric”. To bring these arguments to bear on pressing contemporary questions facing organisational, community, religious and political leaders about the proper manner in which leadership and influence should be sought and exercised. Scholarship on ancient dialectic has tended to neglect its real-life (i.e. outwith philosophy) practical role as a expertise in exercising persuasive influence over others. Scholarship on ancient rhetoric has tended to under-emphasise the evaluative significance of debates between ancient theorists about the status (e.g. as technê) or the contents of an expertise in rhetoric (i.e. what techniques should be included within ‘rhetoric’). The core insight is that these are debates about what skills and techniques are worth acquiring, cultivating and allowing. Scholarship on both ancient rhetoric and ancient dialectic has tended to neglect the ways in which the two skills are rivals to each other, or are otherwise importantly related to each other within the thinking of ancient theorists (the treatment of some parts of Aristotle’s Rhetoric and Plato’s Phaedrus are significant exceptions, but serve to highlight the absence of such connections elsewhere in the treatment of ancient dialectic and rhetoric). These ancient debates constitute a rich and wholly untapped resource for making progress with the pressing evaluative, especially ethical, questions about leadership and influence today, that are starting to be taken seriously by leadership practitioners and leadership theorists alike. The ancient philosophy workstreams are in many ways the fundamental engine of this project. If ancient claims and arguments about skills and methods of persuasion are to be understood and assessed, and if they are to be brought into dialogue with today's ethical concerns about legitimate modes of influence, they must first be accurately understood in their historical setting. The ancient material to be investigated concerns the nature and status of "rhetoric" and "dialectic"
There is the possibility of adding subsequently further Hellenistic thinkers and movements, such as Peripatetics, Neoplatonists and Sceptics. By what psychological means does it achieve its persuasive effect? In what ways and to what extent does persuading other in this way benefit or harm them? What (if anything) is the value of an expertise in each of rhetoric and dialectic, and consequently what status (eg that of 'technê') should be accorded to such an expertise? What psychological mechanisms are implicated in different methods of persuasion and influence? What are the epistemic credentials of each mechanism (does it convey knowledge, does it reliably impart true beliefs, what are the merits/defects of the cognitive states it promotes / gets rid of)? What kind of state should we be looking for influential mechanisms to produce? That is, is leadership a matter of getting people into a state where they can be relied upon to behave in a certain way? Or is something more like doing the right thing for the right reasons (and with the right disposition to sensitivity to other counterfactual patterns of reasons) the desired aim? To what extent should this kind of consideration – about the desired end-states produced – guide a leader’s choice of methods? Scalability – to what extent is there a tradeoff between the epistemic and ethical merits of a persuasive method and its scalability? 'Technê' status: to what extent does it make sense to value a transferable skill in “leadership” or “influence” in ourselves and others, or to try to build a career in leadership-generally (rather than in the pursuit of some other goal to which leadership-towards-that-goal is valued as an instrumental means)? How should one evaluate the legitimacy (epistemic and ethical) of using aesthetic features of discourse and communication as a persuasive tool? How should one evaluate the legitimacy (epistemic and ethical) of engaging the target’s emotions, in the course of deploying one or another method of persuasion? What is dialectic? What is it for? How should it be practised (or exercised)? The workshop poses these questions in relation to Plato’s Republic and post-Republic dialogues. The workshop's focus will be on careful interpretation of key passages in late Platonic works. But the questions listed above show that this carries much wider significance for our understanding of the nature and value of dialectic, and of philosophical method, in Plato and beyond. Speakers include: Dr Matthew Duncombe (Durham), Dr Fiona Leigh (UCL) and Professor Vasilis Politis (TCD). The day workshop is an attempt within academic ethics to develop an "agenda" of ethical issues relevant to leadership within the Church of England, drawing on perspectives from Christian Doctrine. In much of the debate following the Green and FAOC Reports on leadership within the Church of England, an appetite has been expressed for the church to approach the development and the exercise of leadership in ways that exhibit a strong commitment to the values and commitments that are at the heart of the church's life. This workshop on the ethics of leadership may be seen as a contribution towards satisfying that demand for authenticity. Workshop delegates are welcome to join us for supper on the evening of Monday 23rd May from 1800 hrs. Building on last year’s forums on the methods of leadership, these sessions aim to share the fruits of learning to date, make further progress, and shape an agenda for further research. These events are by invitation only and each forum will be conducted under the Chatham House Rule. Why it matters to identify the appropriate standards for evaluating leaders. A range of rival ‘models’ of leadership and their implied standards of ‘good’ leadership. What is involved in choosing between rival models and standards of leadership. Models of leadership and developing excellence in leadership. To secure a better understanding of the tasks of leadership and the standards by which leadership should be judged – and how practically to apply this in organisations, communities and teams. To bring contemporary leaders into contact with the ethical insights and research into the ethics of leadership and persuasion. To enable the concerns and practices of real-world leaders to shape research into the ethics of leadership and persuasion within the Leading Minds project. As part of the 10th anniversary celebrations, the Applied Ethics Conference contained a Leadership Ethics Session. Professor Jackie Ford presentation can be seen below. The winter meeting of the Yorkshire Ancient Philosophy Network, within the Centre for the History of Philosophy, was held at the Inter-Disciplinary Ethics Applied (IDEA) Centre, University of Leeds. Leaders need to persuade in order to get people into action, but in an increasingly transparent world, the methods they use are becoming more visible and, as in politics or the media, approaches that are ethical will become more obviously distinct from those that aren’t. But what is an ‘ethical approach to leadership’? 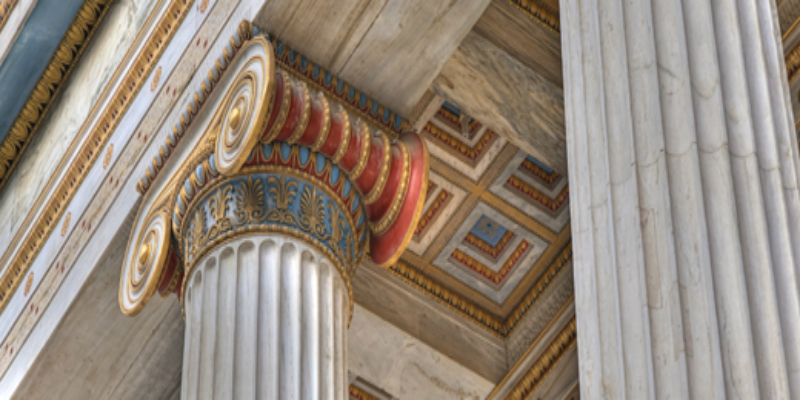 To find a strong set of principles to guide us we draw on two sources; the ancient Greeks whose philosophers were the first within the Western tradition to consider this issue, and a group of current senior leaders with an interest in the subject. Ethical issues affecting the methods of leadership. The current state of leadership ethics – for senior leaders. The ethical use of leaders’ character and credibility. “Artistry” and manipulation in leadership. To secure a better understanding of the ethical challenges facing leaders, with regard to how they seek to secure the willing cooperation of others. To bring contemporary leaders into contact with the ethical insights and challenges from recent scholarly research into the ethics of persuasion (esp. recent insights from ancient discussions of the use of ‘rhetoric’ and ‘dialectic’ in persuasive influence). To enable the concerns and practices of real-world leaders to shape research into the ethics of leadership and persuasion within the Leading Minds project. This is expected to deliver a transformative impact on the relevant scholarship. To develop and refine material for a leaders’ briefing paper along some such lines as, “7 ethical questions that every leader should be asking themselves”. Below are details of past events related to the project. 2. challenge the ancient philosophical scholarship by subjecting its arguments and recommendations about the exercise of persuasive influence to scrutiny by those closely versed in the actual practice of persuasive influence over others behaviour. The workshop represented a major step forward in this area. It was undertaken as the first of a series of events, to constitute a larger research project, Leading Minds, and as setting the agenda for what follows. Thus the impact and effectiveness of the workshop will be carried forward in the subsequent project stages. To pilot the pursuit of research questions about the ethical and epistemic propriety of different kinds of uses of discourse (esp. dialogue-based, and using rhetoric) through the two disciplines of Ancient Philosophy and modern Leadership Studies. The workshop aims at giving academics in each of these disciplines some visibility of scholarly work on related topics in the other, and promoting interaction between them. To bring both the above approaches into dialogue with senior leadership practitioners. To identify fruitful research areas for the Leading Minds research project, and use these to develop a programme of research workshops 2014-17 for which funding will be sought. To identify key participants suitable to contribute to this research, (i) in Ancient Philosophy; (ii) in Management / Leadership Studies; (iii) in other relevant disciplines (eg social psychology); (iv) among leadership practitioners. This is partly about identifying those whose work within their own discipline can contribute to this research programme, as well as those capable of working and interacting across disciplinary boundaries. To begin the development of a local-and-international network of academics and practitioners interested in working on discourse and influence, and the ways in which themes from Ancient Philosophy can be brought into illuminating dialogue with themes in Management / Leadership ethics today. A workshop on the use of bad arguments (effective but fallacious or otherwise objectionable inferences) in Aristotle's Topics, Sophistical Refutations and Rhetoric. Jackie Ford discussed the topic of missing women at the top of professional occupations. In her presentation Jackie reported preliminary findings from a study of the working lives of late-career professional and managerial women. This is the first generation of women aged 50 plus to routinely continue in their careers until retirement age. The ‘late career woman’ is therefore a new phenomenon. Very little is known about her and how she perceives herself or works on herself, nothing about her aspirations and expectations for the last one-third of her working career, how she combines a career with caring responsibilities, or how her life changes if caring responsibilities have changed or diminished. We do not know if she experiences ageism or sexism in the workplace, whether she becomes invisible (as older women did in past generations), or whether she is a valued or disposable resource. How does she experience changes in her body and in her health, and what impact do these have on her experience of herself as a career woman? In short, we know next to nothing about the identity of the ‘late-career woman’. It is still too early to draw conclusion from the study, but I aim to present preliminary analyses of the data and explore the wider implications for women in the professions and (a) the working lives, identities and careers of professionals and how these impact on the doing of their work, and (b) their gendered dynamics. A paper examining various options for explaining why Socrates, as a matter of policy, rejected speechmaking in favour of dialectic, as a means of influencing and benefiting others. In this paper, I build on existing, largely uncontroversial, interpretations of familiar texts to raise a puzzle about a major feature of Socrates’ life and practice that has not, I think, attracted the level of explanatory zeal it deserves. Why Socrates, in his endeavours to benefit fellow-citizens and the city overall, rejected speech-making in favour of small-scale philosophical conversation is, it turns out, surprisingly difficult to explain satisfactorily. If my tentative positive proposal is right, the explanation lies in uncovering a Socratic analysis of the difference between the pressure that people exert on one another’s beliefs and preferences when gathered in a multitude, and the way in which rational pressure may be brought to bear on an individual when that individual thinks alone or with only a few others. More importantly, however, I hope to have brought to light an issue in Socratic method that deserves serious scholarly attention, and for which the principal themes of recent scholarship on Socratic method do not provide an easy resolution. Ann L Cunliffe, Professor of Organization Studies, Business School presented on the topic of The Embedded Nature of Leadership, Relationality and Ethics. Over the last five years an increasing number of business scandals have hit the media – scandals that leave us wondering whether ethics and leadership are contradictory terms. So how might we start thinking about leadership and ethics differently? I suggest we need to go back to the fundamental ontological question about the nature of social reality and who we are in the world. If we begin to think about everyday life as intersubjective, then leadership is embodied in who we are and embedded in our everyday conversations and interactions with others. I propose that this form of leadership foregrounds relationality and the need to make morally-informed judgments through a form of ethics I have called relational integrity.